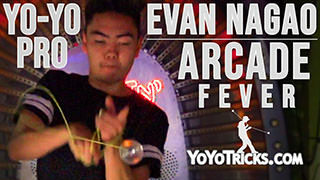 Learn Evan Nagao’s trick Slackalicious. To start this trick off, you want to make sure that your string tension is neutral, because if you did not guess it, Slackalicious is a slack trick. 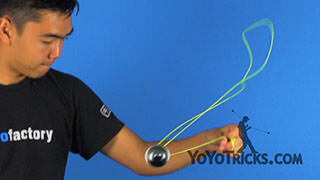 To start this trick off, the first element is like the first element of Yuuki Slack, which looks like this. 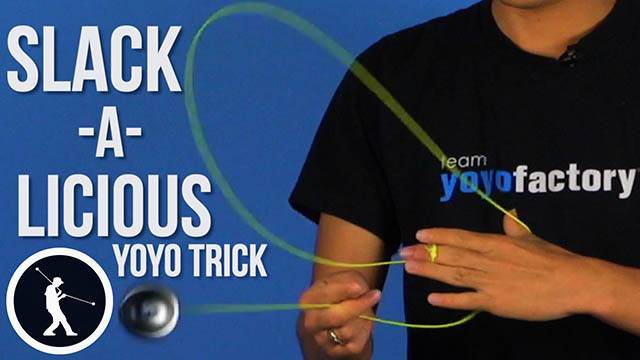 If you do not already know how to do Yuuki Slack, you can go check out the trick tutorial on YoTricks’ website. From here you are going to stick out your middle finger. 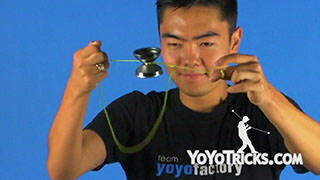 Then you are going to pop the yoyo off the string, onto an undermount. 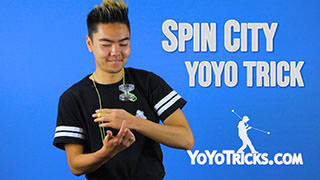 While you do this, you are going to simultaneously pinch with your thumb and your middle finger of your non throwhand and you are going to let go of the slack on your throwhand. 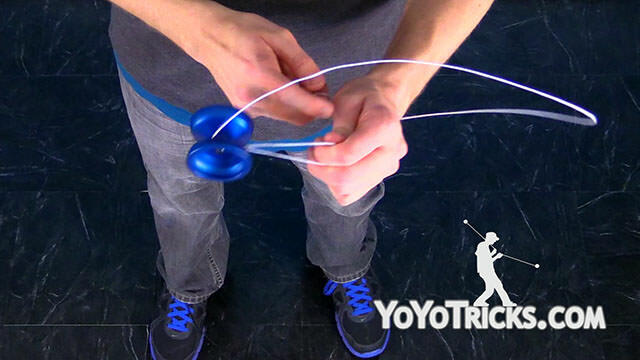 Make sure that your are doing the undermount simultaneously while you are pinching and letting go of the slack so that it keeps the flow of the trick. As this point, you are going to want to put your throwhand under the string, causing a slack to form. 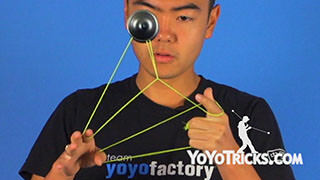 Then throw the slack over your non throwhand wrist. 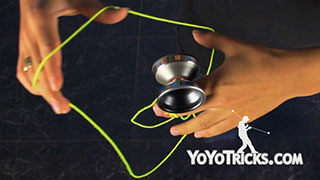 Make sure that your thumb is pointed towards your body to keep the slack open for the next part of the trick, which is to throw the yoyo over your index finger through the slack and onto the middle string. 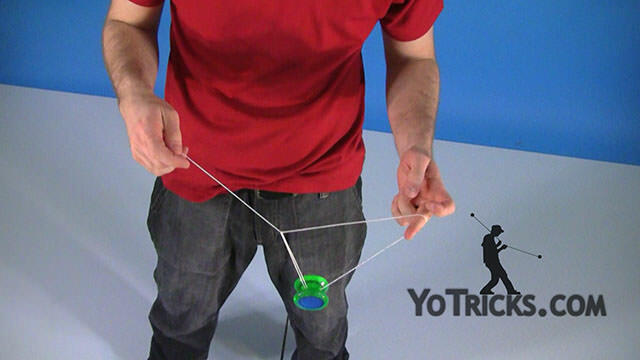 Then you are going to release your pinch and the tension of the yoyo will cause the slack to pull taut and off of your wrist. Then you are going to turn your palm face up and you are going to pinch with your thumb and your pointer finger. 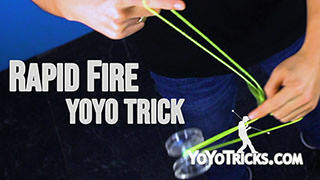 Then you are going to swing the yoyo around and let go of your thumb. 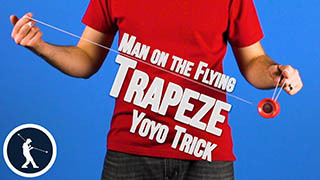 You are going to catch the yoyo over your hand and onto your wrist from the front. 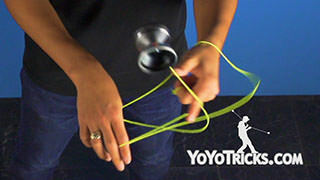 One common problem you may have with this element is that the slack does not stay open enough to catch on your wrist. 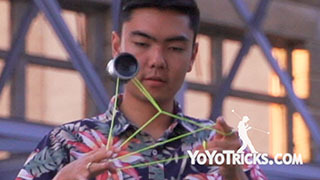 To solve this problem, you are going to want to make sure that the proportions are such that this triangle right here is less than half the size of this triangle over here, and that the distance between your pointer finger of your non throwhand and the intersected string right here is less than an inch. If you get the proportions down and the timing right, it should keep the slack open so that you can catch it easily. 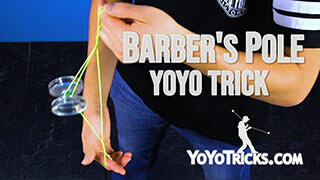 From here, you are going to want to toss the yoyo inside of the top string and then while the yoyo is in the air, you want to pluck the bottom string on the yoyo with your thumb. Land on the front string. As this point, you are going to want to pinch with your index finger and your middle finger on your non throwhand. Then you are going to want to drop your thumb. 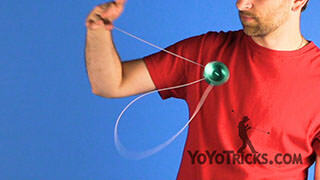 Then you are going to swing the slack around and onto your thumb again. 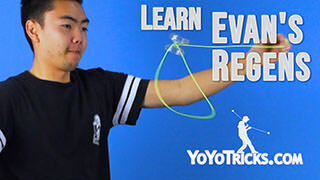 Make sure when you do this that your thumb on your throwhand is your only finger that is connected to the string and not any of your other fingers. 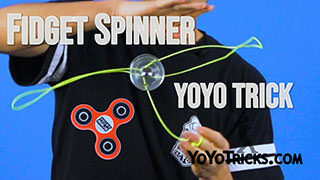 At the same time that you are doing this, swing the yoyo around and then on the inside and onto the string connected to your yoyo finger. Then you are going to drop the thumb on your non throwhand. Then pop off the front, over the kink. 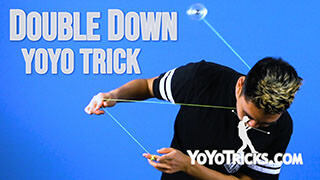 Then you are going to drop the thumb of your throwhand and now you are in a green triangle. 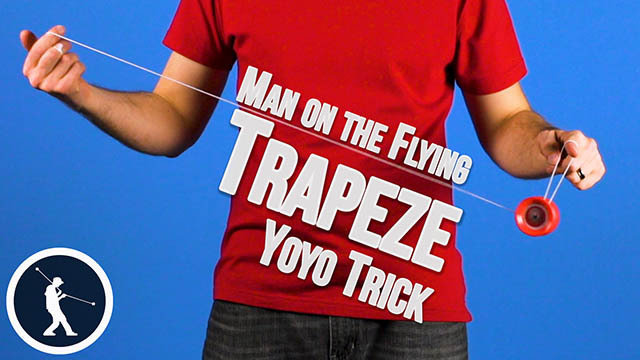 You are going to pop off the front into a trapeze. 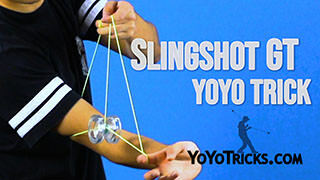 Then you are going to Sky Bind with swag, and that is Slackalicious.